Let me tell you about a small nation that doesn’t have the best reputation, but that every traveller who visits yearns to return. Somewhere that is made out to be violent – its capital makes lists of most dangerous cities in the world time and time again – yet is home to astonishingly warm people, beautiful landscapes, great music and an addictive culture. 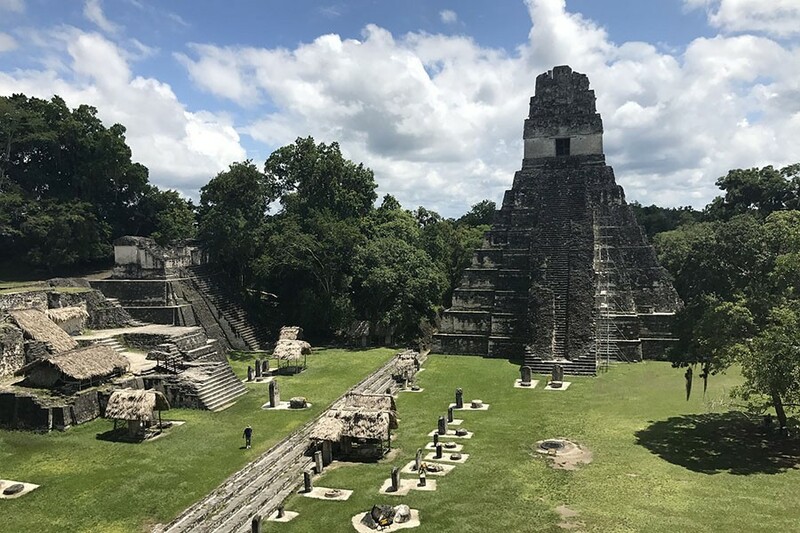 This Guatemala itinerary will show you the best places to visit in Guatemala, with tips on how to stay safe when travelling and visiting different spots. First things first – you can travel safely in Guatemala. I’m not going to say that the country is without its problems, because it’s not. There’s some neighbourhoods of Guatemala City that you shouldn’t even walk around in the day, and there are big problems in the country with gangs and drug trafficking. But tourists are very rarely the target of any violence, and the majority of places in Guatemala are safe for foreigners. I’ll make a note of where isn’t in this Guatemala itinerary. This guide to Guatemala will show you the best ruins, lakes, volcanoes, cities and markets in the country and I guarantee you’ll finish reading it looking at flights. Guatemala, with its delicious avocados, illicit saints, crazy chicken buses and unforgettable atmosphere does that to people – and as soon as your visit is complete you’ll be plotting your return. 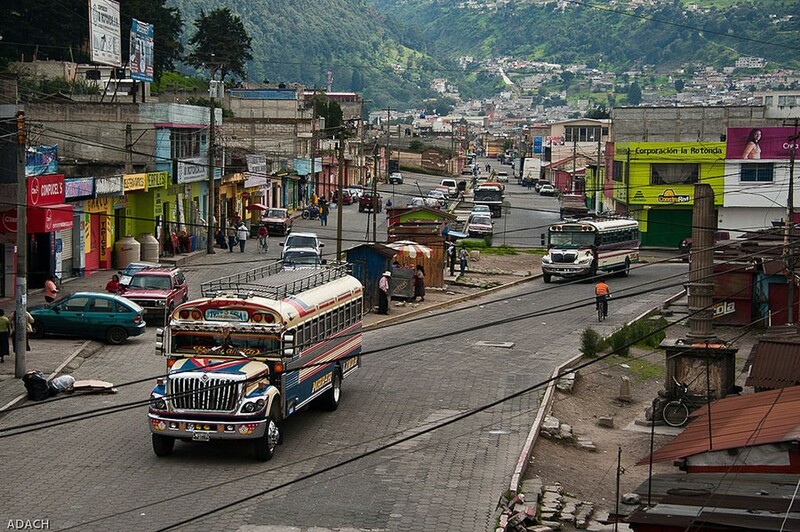 Where you arrive in Guatemala will depend on how you’re getting to the country and where you’re travelling from. 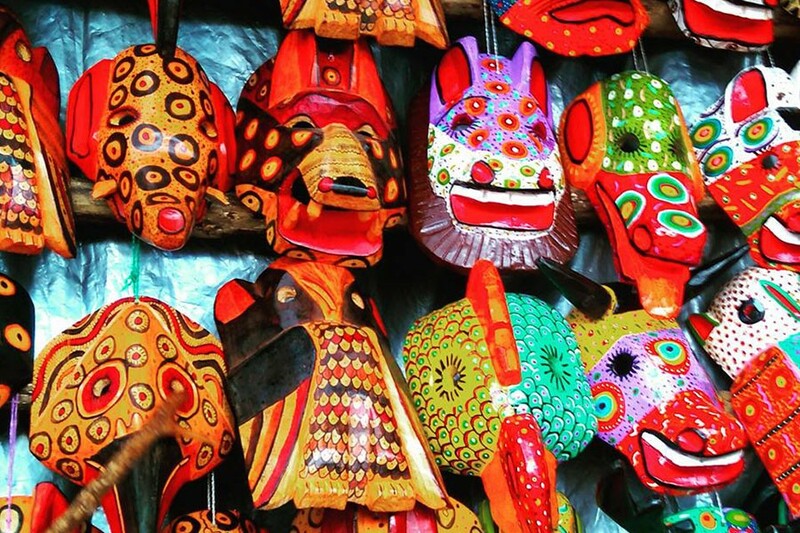 How you use this Guatemala itinerary will depend on where you’re starting place is. If you’re flying in, you’ll arrive into Guatemala City. I would recommend heading north first on a night bus to Flores and then travelling this itinerary as it is written. 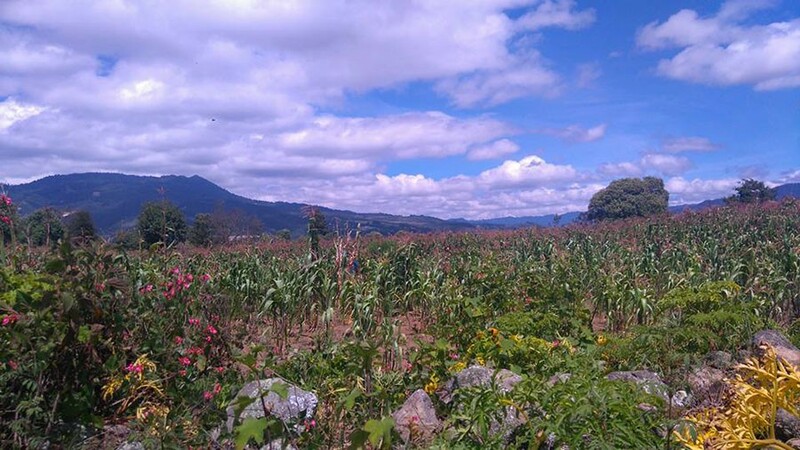 The exception to this would be if you’re planning on crossing the border into Belize or Mexico afterwards; if you’re crossing into Belize, make Flores your last stop and if you’re travelling Mexico after, make Quetzaltenango your ultimate destination in Guatemala. If you’re crossing the border from Belize, follow this itinerary. If you’re crossing the border from Mexico, follow this itinerary from Quetzaltenango and then head to Semuc Champey and Flores from Guateamala City. You can then either return to the city, or cross the border into Belize. If you’re crossing the border from Honduras, do this itinerary in reverse (possibly with an extra first stop in Antigua) if you’re then looking to cross into Belize. If you want to cross into Mexico, head to Flores and Semuc Champey first and then do the rest of the itinerary in reverse, ending in Quetzaltenango which is the right part of the country to cross into Mexico. If you’re crossing the border from Belize, this will be the first stop on your Guatemala itinerary. If you’re travelling from Belize City, there is a Linea Dorado bus you can take that crosses the border and costs around $23. There are also local buses ploughing the route, but the Linea Dorado is generally more secure. If you’re arriving into Guatemala City, I’d recommend taking a night bus to Flores – that way you save on a night’s accommodation! Many people will suggest flying, but I always advise people to think about the environmental impact of flying short journeys that you can easily take by bus. It’s real, folks. The amount of time you’ll want to spend in Flores depends on how long you have for your Guateamala trip, and how much you are in need of some rest! I’d recommend at least spending the day after your arrival and the day after just checking out the town. If you’re in a real rush, you can probably shave off one of these days, or if you’re moving at a leisurely pace, you can stay for as long as you want! Los Amigos is a somewhat legendary hostel in Flores, with a bar/ restaurant offering giant jenga and lots of food and drinks deals and a fun social atmosphere. If you’re looking for somewhere a bit quieter, Hostel Yaxha is great. With free WiFi, clean bathrooms and bedrooms, it’s a great spot to kick back and chill. Click here for rates and book. If you’re looking for somewhere with a bit more privacy, the Zapote Tree Inn is located close to Santa Elena. Home to a bar, a swimming pool, and serving a delicious breakfast and has spectacular views over the lakes. Click here for rates and book. Flores is pretty safe, but petty theft is common so keep everything locked up and don’t flash your valuables. Take care at night, especially if you’re on your own. Tikal is a highlight on anyone’s Guatemala trip itinerary. Dating back maybe to the 1st century AD, the ruins are steeped in history and there is lots to explore. The ruins will make you feel like you’re in Indiana Jones, and they’re nestled into lush jungle which is populated by howler monkeys and colourful birds. The ruins are great to explore for a day or two. If you really want to take Tikal in, do a sunrise or sunset tour (or both!). Otherwise, you can just pay for admission and explore the grounds at your own leisure. Tikal can be seen in a day, but many travellers spread it out over two so they’re not rushed and have the freedom to enjoy as they please. 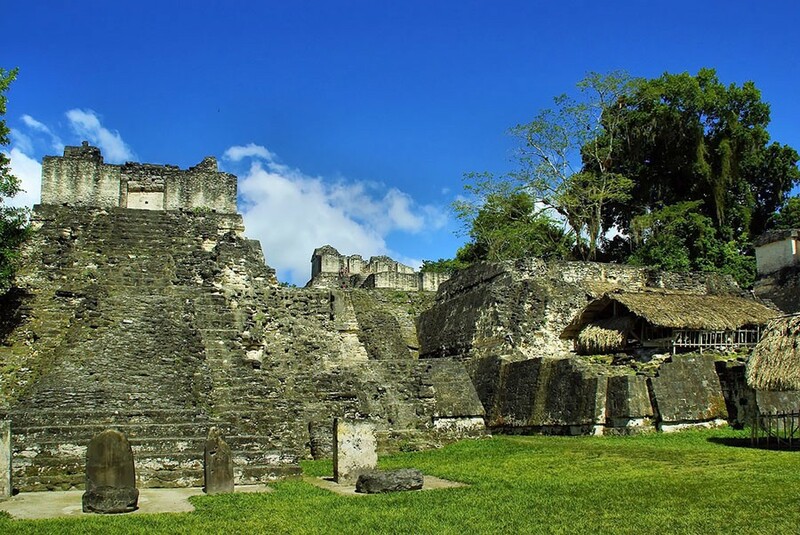 As Tikal is so close to Flores, you can return here to stay after seeing the ruins. The best way to reach Semuc Champey is tourist shuttle, which can be organised through your hostel. You could chicken bus it, but it will be long and complicated. The shuttle will drop you at your hostel. Alternatively, you can change in Coban to Lanquin. The shuttle takes around 8 hours though and the buses only run during the day, so be prepared for a long travel day! Semuc Champey is a beautiful spot that is the highlight of many different traveller’s Guatemala itineraries. 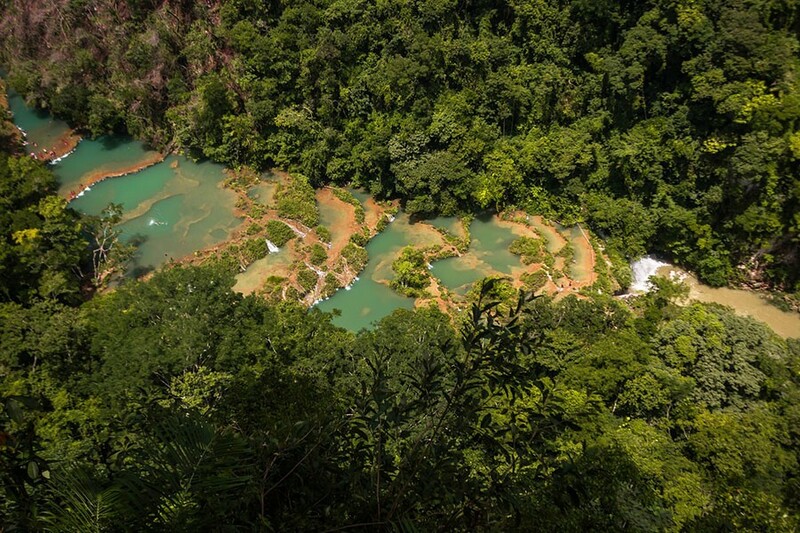 With stunning blue pools and waterfalls nestled amongst the jungle, Semuc Champey is a natural phenomenon. River tubing – you can rent a tube and drift around! The caving is not without its dangers – know the risks and take great care, as the nearest hospital is 4 hours away in Coban! Lanquin is a cute but very small town. If you are staying there, taking an extra day to chill out (to ensure that you don’t spend all of your time on buses!) is a good idea. You’ll either stay very close to Semuc Champey or in Lanquin. Hostal Vista Verde Lanquin is in a beautiful spot, and has private and dorm rooms located in gorgeous huts. The hostel is located next to a river and features a bar and a delicious breakfast. Click here for rates and to book. Aaah Quetzaltenango (also known as Xela, its indigenous name). I spent a month here learning Spanish, and really loved the city. It’s Guatemala’s second largest, but it’s pretty tiny. There isn’t a crazy amount to do in Quetzaltenango, but walking the streets and just observing the lifestyle here is pretty enjoyable. Most of the travellers that pass through here are learning Spanish or volunteering, which makes it a cool place to meet people (cos y’know, travellers who learn Spanish are cool 😉 ). There’s a few different bars, cafes and restaurants that even have some decent veggie options. Visit Maximon, who also resides in San Andres. He’s an illicit saint who wants offerings of booze and cigarettes – if you don’t leave them he will curse your love life forever. You have been warned. Sabor de India – this is actually decent Indian food in Central America. Say whaaaat? La Esquina Asiateca – every Saturday, this joint does a delicious buffet for very cheap prices. I’m pretty sure it’s all vegetarian as well. Pool and Beer – is pretty much the only ‘club’ I ever went to – I also had one of the worst hangovers of my life after drinking a heap of rum from here. Cafe la Luna – this is a cool joint with lots of memorabilia on the walls and a good selection of drinks. I’m aware that I’ve recommended mainly ‘gringo’ restaurants – the reason for that being when I was in Xela, I was eating local food with my host family most days so I only really went out on special occasions, when we were likely to try a different type of food. In Parque Central there are heaps of street food stands and comedors are all over the place, if you want to try something a bit more authentic! The Fuentes Georginas, which are natural hot springs located a little out of town. Tajumulco, Central America’s highest volcano. It’s an overnight trip to summit it, and you’ll get to see a beautiful sunrise over the surrounds. Chichicastenango, which is Central America’s largest market. It’s a great place to stop if you want some fabrics or other souvenirs, and is well worth the visit even if you don’t buy anything. 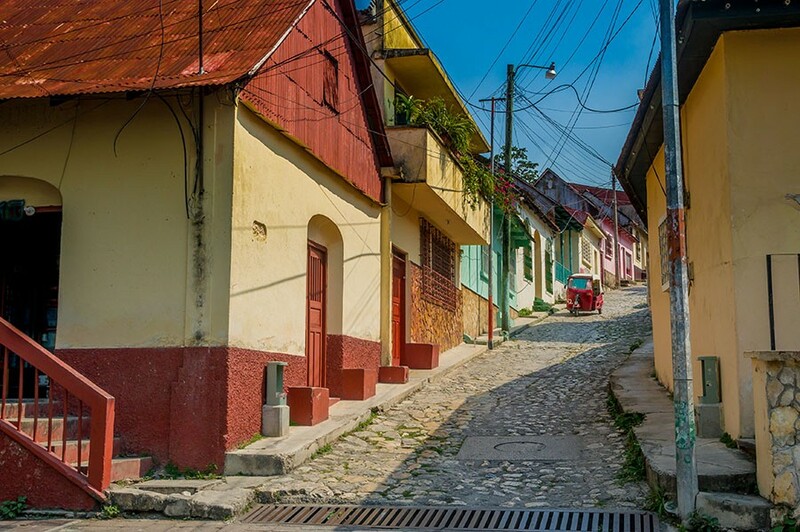 If you fancy setting up home in Guatemala for some time, consider Xela – it’s a really awesome place. As mentioned, it is abundant with Spanish schools and volunteering opportunities, so there’s plenty there for you to enjoy! 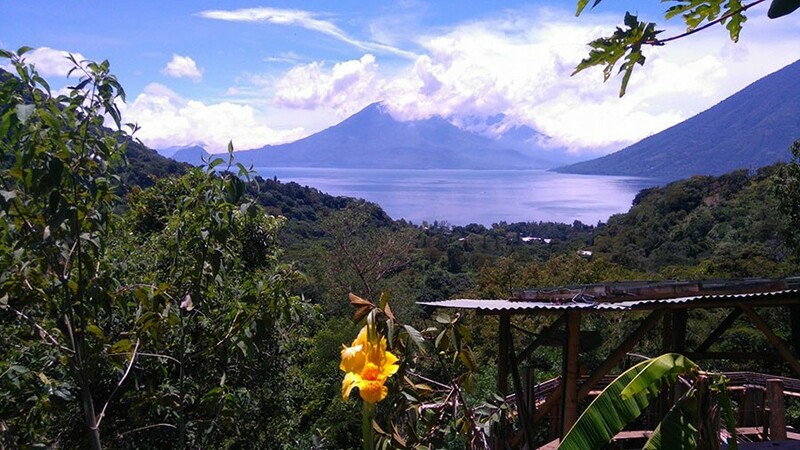 My last Xela gem is that you can actually do a 3 day hike from the city to Lake Atitlan – your next stop – with Quetzaltrekkers. Regrettably mine was cancelled, but it’s meant to be an amazing experience so if you have the time definitely try to do it! Casa Seibel is a lovely, laid-back place which has a great homely feel. Kitted out with a full kitchen, hammocks, chill areas and an open courtyard, it’s a great hostel to chill in the city. Visitors can stay in dorm rooms – which have single beds rather than bunk beds – or private rooms. Click here for rates and to book. Latam Hotel is a 4 star hotel in the city, featuring private bathrooms for each bedroom. It has a swimming pool, a bar and serves a fantastic breakfast, and rooms are kitted out with WiFi and air conditioning. Click here for rates and to book. Xela is pretty safe by Guatemalan standards. I wouldn’t advise walking anywhere alone after around 10pm. Taxis are safe to hail on the street. Use your common sense and don’t flash around valuables and take care if you are on any of the trails around the city. I did hear about a couple of muggings while I were there, but nobody was hurt. 2-7 days – depending on how much chill you want and how many villages you want to visit! 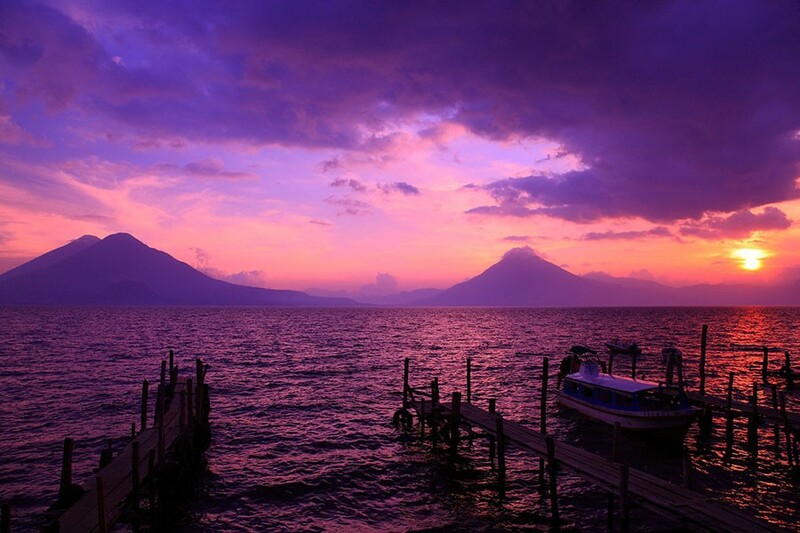 If you haven’t trekked to Lake Atitlan, you’re going to want to find another way to get there. It’s easy to reach Lake Atitlan from Xela by chicken bus – and here’s your chance to see something that makes Guatemala famous! You’ll need to take 2, maybe 3 buses to reach Panajachel from Xela. There is also a direct bus to San Pedro, but I’ve heard that the road it takes is quite dangerous (it also leaves very early, and I slept in when I was travelling to Lake Atitlan from Xela). Chicken buses in Guatemala are vague, so I’m going to have to be vague here. You’ll need to head down to Xela’s main bus station, say you’re going to Atitlan or Panajachel, and be shepherded on a bus. It won’t go to Atitlan, but you’ll be told where you need to get off. There’s always a helper on Guatemalan chicken buses as well as a driver, and they will remember you, tell you where to get off the bus and be waiting with your backpack as you disembark. I don’t know how this works, but it does. They’ll tell you where to wait for the next bus – and so the process will then begin. It helps to know some Spanish to take the chicken buses in Guatemala, but it’s not 100% essential. Once you’re there, I’d recommend spending one night in Panajachel, which is really one night too many. BUT there’s a really nice walk that you can do to ? with some amazing views over the lake, and then you can take a pick up truck back. Unless you set off at the crack of dawn, you probably won’t manage to get to the lake, do the walk and catch a boat to another of the lake’s villages, plus you’ll have all of your belongings on you. Definitely the backpacker hub of Lake Atitlan, San Pedro is fun to stay in and explore for a day or two. I found the tourism a bit too much though – especially after coming from non-touristy Xela. Still, it’s a fun place to explore on foot and the Indian Nose volcano can be hiked from here as well. It’s also a fun town to have a few drinks in the evening if that takes your fancy. San Marcos is the hippy hub of Lake Atitlan. It’s tiny, so is doable as a day trip from one of the other towns, but I’d really recommend checking out The Yoga Forest while you’re here. This is an amazing yoga retreat above the town. Room rates include 3 yoga and 1 meditation session every day, all your (delicious and vegetarian) meals and other activities. The retreat is in a beautiful surrounding and it has a strong focus on sustainability and permaculture. It’s worth spending a night here at La Iguana Perdida, a chilled hostel that offers family-style dining. You can do a coastal walk to Jabilito, a neighbouring village, and if you are certified you can dive in the lake which is meant to be pretty cool. If you’re on a budget and looking for somewhere a bit different to stay, Free Cerveza is a great option. Here you can go glamping while overlooking the beautiful volcanoes of the lake. Kayaks, sauna and Wifi are all provided. There are Mayan chefs who serve up breakfast, lunch and dinner. Click here for rates and to book. With a private beach and garden, Casa Paxanax is highly rated, with spacious bedrooms and a gorgeous view. Click here for rates and book today. If you’re after somewhere a little more luxurious, Casa Prana offers fitness and yoga facilities, and each bathroom offers bathrobes, a hairdryer and free toiletries. There is a bar on site. Click here for rates and to book. Now, I actually didn’t feel that safe in Panajachel. I’m not sure if this was just due to who I met – it was the only situation in the whole of Guatemala where I actually thought ‘this could go badly’. I had a guy follow me (I had to ask the tuk tuk driver to step on the gas so he wouldn’t get in it and then he managed to catch up on me!) and eventually I ended up getting on the next shuttle to Antigua to get away from him. I was also chased by a dog, absolutely drenched by a torrential downpour and contracted the worst food poisoning I’ve ever had in Panajachel. It might come as no surprise to you all that Panajachel is my least favourite place in Latin America. I haven’t heard many other stories about Panajachel being unsafe, so it may have just been my experience. However if you want to hike on the trails around the lake, be very careful. I hate to say this, but hiking as a solo female on some of these trails isn’t recommended, and neither is carrying too many possessions. I hiked from Panajachel to Santa Catarina Polopo and Santa Cruz to Jabilito alone and had no problems. But this isn’t to say that there will never be problems – make sure that you ask local advice before you set out. 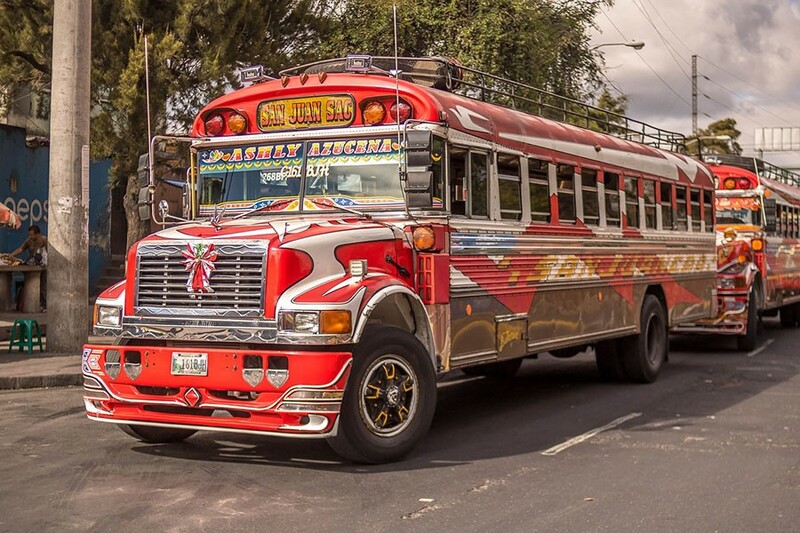 You’ll want to head back to Panajachel to get to Antigua, but it’s quite easy to take the chicken buses as well. Antigua is a popular destination with travellers to Guatemala. 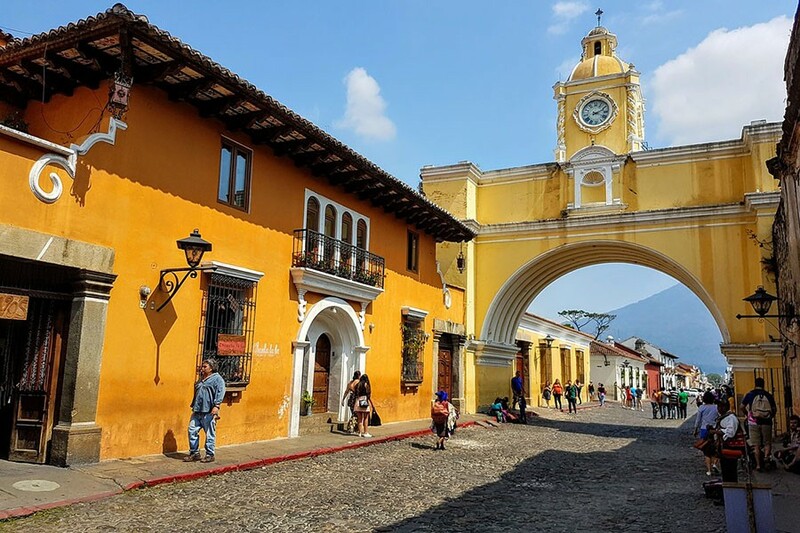 It’s easy to see why – the colonial town is absolutely beautiful, with cobbled streets and colourful buildings, loomed over by a giant volcano. 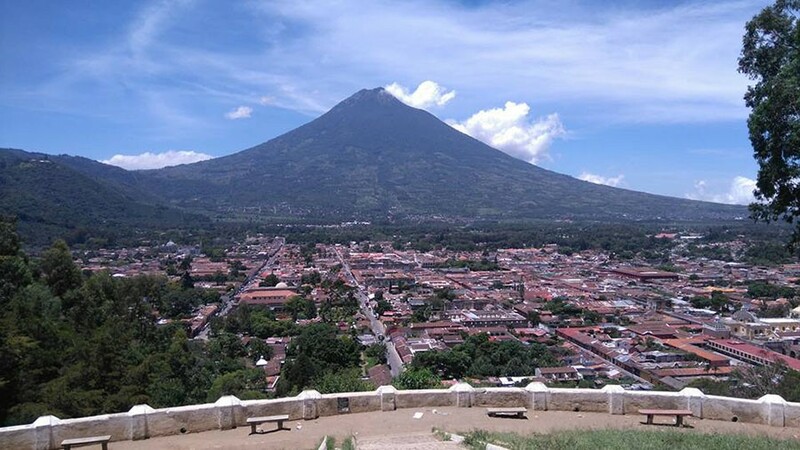 Antigua made headlines in June 2018 because the city was covered in ash after the eruption of Fuego Volcano, but in true Guatemalan style, the city is back on its feet. It has even recently stated that it is banning single-use plastics, an amazing reason to visit! You can also take a day or overnight tour to some of the volcanoes near Antigua. 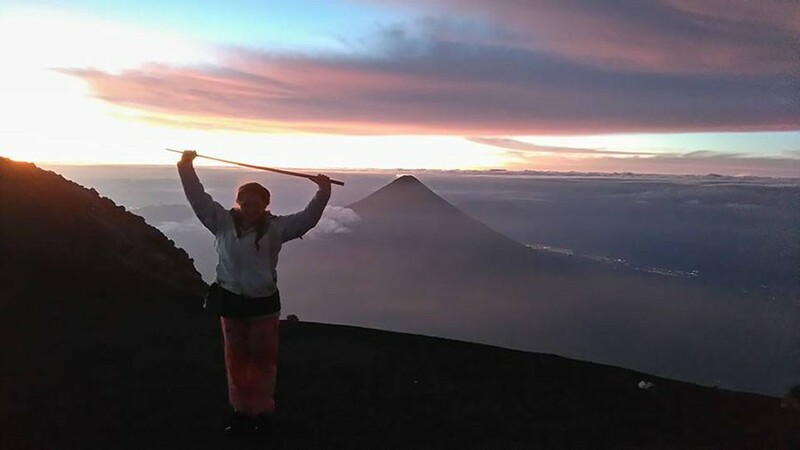 Pacaya is an easy-ish climb where you can roast marshmallows on the top, and Acatenango is a gruelling ascent with an overnight camping stay and some phenomenal views – you’ll get the chance to see the sunrise from the top of the volcano. After the eruption in June, Acatenango is now open. Bigfoot Hostel has an awesome atmosphere and is a great place to make some travel pals. The dorms and private rooms are quirkily decorated and it is located in the centre of Antigua. Click here for rates and to book. If you’re looking for some privacy, La Casa de Don Pedro is close to the Santo Domingo Cultural Centre and it features colonial-style rooms with free WiFi and offers a delicious breakfast. Click here for rates and book today. There is a high presence of tourist police, making Antigua probably the safest city in Guatemala. You are unlikely to get robbed during the day – there is a higher chance at night. Stay in the central areas, don’t walk around alone at night (you’re probably ok walking back to your hostel if it is centrally based and you are in a group) and be wary on the hiking trails around Antigua. Do not hike Volcan de Agua. There have been violent robberies and kidnappings on the volcano, and guided tours don’t even do the routes any more due to the danger. Although Monterrico won’t make any world’s best beach town round-ups, it’s still worth checking out to see a different side to Guatemala. It’s possible to take the tourist shuttle or, again, a collection of different chicken buses to reach the town from Antigua. If you want to take the chicken buses, set off early to reach Monterrico in the same day. 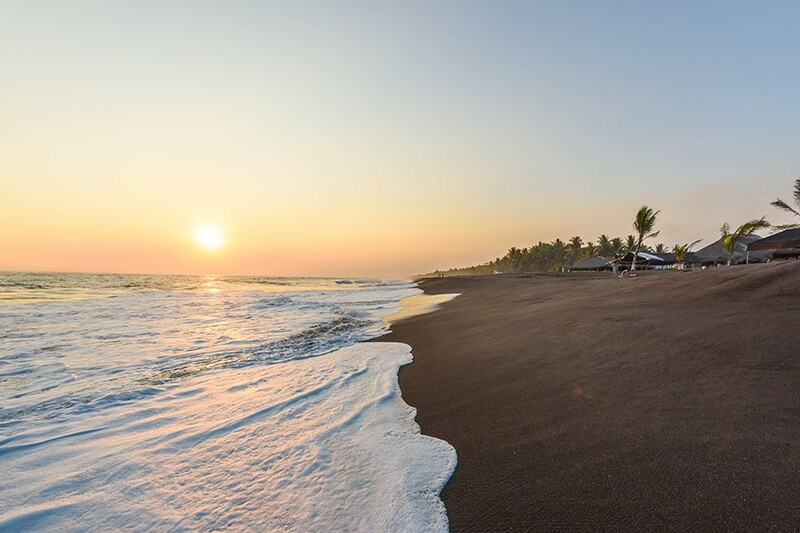 Monterrico is a black sand, volcanic beach which makes for some cool photos. It’s a good place to just enjoy the beach, although do be wary about the power of the sea – rips and large waves are very real and only experienced swimmers should venture very far out. There is also a waterpark called H2Olas. If it’s a hot day, it could be fun! For a cheaper hotel option, La Palma B&B has a terrace, an outdoor pool, a bar and offers a delicious free breakfast. Click here for rates and to book. Slightly more expensive is Burí Hotel, which has a terrace and a bar. All rooms have a flat screen TV and a private bathroom. Click here for rates and book today. Monterrico is fairly safe, but as with everywhere in Guatemala, avoid walking around alone at night. I’d recommend taking a tourist shuttle from Monterrico to Guatemala City. You’d probably be fine on the chicken buses, but Guatemala City is the one place where the chicken buses are dangerous and can be hijacked. Taking a shuttle will mean you’ll be dropped at your accommodation and then you’ll be able to settle into the city from there, without having to walk around with all of your worldly posessions on you. Now, Guatemala City. It’s the only place in Guatemala where you could get into a spot of bother. Is it worth visiting? Some people would say yes and some would say no. I think, as long as you stay safe, you’ll be fine and it’s worth seeing the capital just to get a good overall feel for this country. Have a nice long chat with your hostel/ hotel owner about what areas are safe and what aren’t. Get them to write them down on a map. When you go out, take a throw down wallet with a bit of cash and a non-used card, if you have one. If you have an old phone, keep that with it. Keep your actual valuables in a money belt under your clothes. If you go out after dark, know your location and use a trusted driver (get your hostel or hotel to book you one). Don’t go walking around at night. Zona Viva (Zone 10) is where you want to stay, and is reported to be safe at night – I’d double check with locals before you go though. Use Uber to get around. If you are a victim of robbery, give them what they want – they may very well have a gun or knife hiding somewhere and phones and wallets are replaceable. Don’t use inter-city chicken buses. The Transmetro buses are reportedly safe and easy to use. If you’re visiting Guatemala City, you’ll probably want to stick to Zone 4, Zone 1 and Zone 10. As aforementioned, Zone 10 is full of nightlife and a lot of Americanised restaurants. It’s not the most authentic part of Guatemala City, but it’s a good place to rest your head at night. Zone 4 is sometimes known as the ‘Brooklyn of Guatemala’ (not a common comparision, but I have heard it!) with cute cafes, street art and even some coworking spaces! It’s worth checking out for a day. Zone 1 is where the historical attractions lie. Biblioteca National – Guatemala’s national library, this is housed in a modern buildling and has 150,000 volumes of books and newspapers as well as works of art. The Theatre International Hostel is a great place to hang out with backpackers in the historic area of the city. Offering hammocks, free WiFi, an equipped kitchen and laundry, it’s a great well-facilitated place. They offer free breakfast and 24 hour security. Click here for rates and to book. For somewhere with a bit more privacy, try Meraki Boutique Hotel. Located in Zona 10, it’s in a great location to enjoy the city’s nightlife and restaurant scene. The hotel offers free WiFi, a bar, room service and luxury rooms with comfy beds, flat screen TVs and en suite bathrooms. Click here for rates and book today. Hotel Clarion Suites are a great deluxe pick. Including a gym, room service, delicious breakfast and contemporary, spacious suits, this is a fantastic spot for a bit of luxury in the city. Click here for rates and book today. Rio Dulce and Livingston are just a little bit out of the way, but they’re well worth the trip for travellers who have a little more time and want to experience the Caribbean side of Guatemala. You can take a bus from Guatemala City to Rio Dulce, taking around six hours. There are not many chicken buses around this area, but Fuente Del Norte and Litegua buses service the route. Castillo de San Felipe – this was built by the Spanish to deter Pirates of the Caribbean (real life ones, not Johnny Depp and Orlando Bloom). It was destroyed in a fire, but it is now in ruins which are well worth seeing. Finca Paraiso – these hot springs have a beautiful cave and are great for swimming and exploring. It’s possible to take a colectivo from town to reach them. Dreamcatcher Eco Lodge is in the middle of a jungle setting; a howler monkey reserve. It has a common room to meet other travellers and offers free WiFi and has a restaurant on site. Click here for rates and to book. Maya Tenamit has many gorgeous rooms all featuring satelite channels and a private bathroom. There is a bar and restauraant on site and it is in a beautiful, tranquil location. Click here for rates and book today. From Rio Dulce, you can take a boat to Livingston down the river. It’s quite pleasant to pass through the river, glancing at the different banks. You’ll arrive at Livingston after about an hour, which cannot be accessed by road. 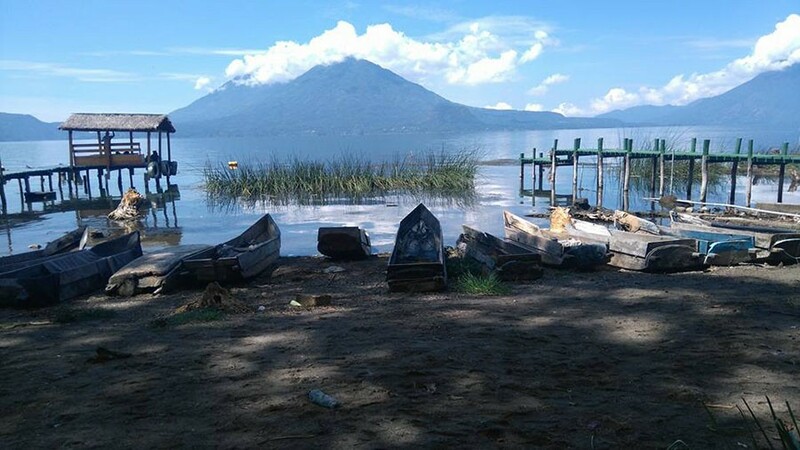 It costs 125Q to take the boat, which is pretty expensive for Guatemala. It is cheaper to take a bus to Puerto Barrios and then another boat, but it takes much longer. 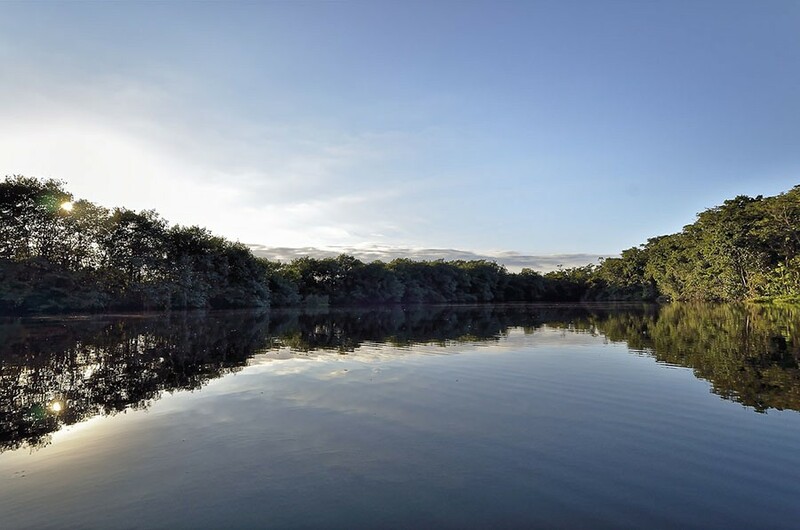 There are lots of activities in Livingston, including trekking, caving, snorkelling and cayaking. You’ll be able to book tours through your accommodation. 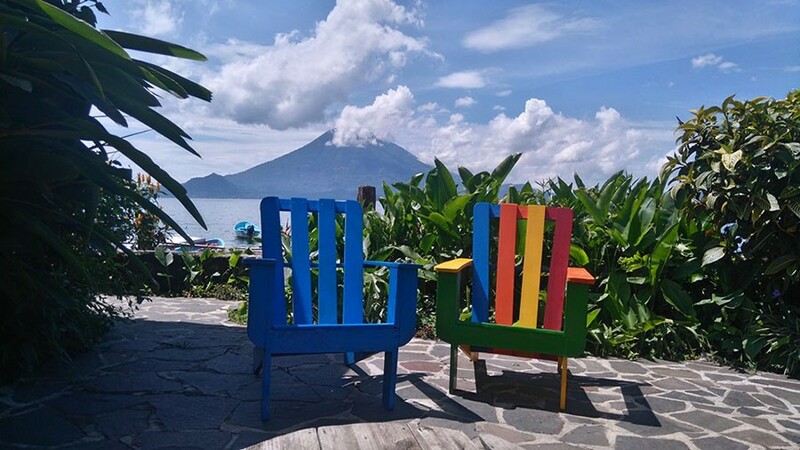 It’s also a great spot to just soak in the Caribbean vibes and enjoy this part of Guatemala. Claiming to have ‘the best food in town and the best view in town’, Casa Nostra is a riverfront home with a 2 story dock and the delicious restaurant. They offer delcious drinks as well! Click here for rates and to book. Villa Caribe has an outdoor swimming pool and a restuarant . It has a lush location, with plenty of flora, and comfy rooms. On site is a bar and the hotel offers breakfast. Click here for rates and book today. 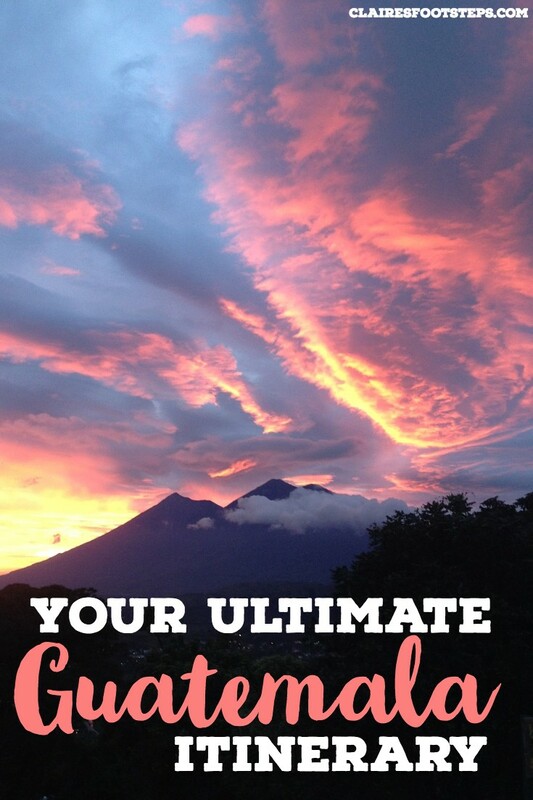 Are you ready for your Guatemala travel itinerary? This post covers the majority of the tourist hotspots country – from ruins to cities to volcanoes to beaches – but of course, like anywhere, you’ll find your own magic here. 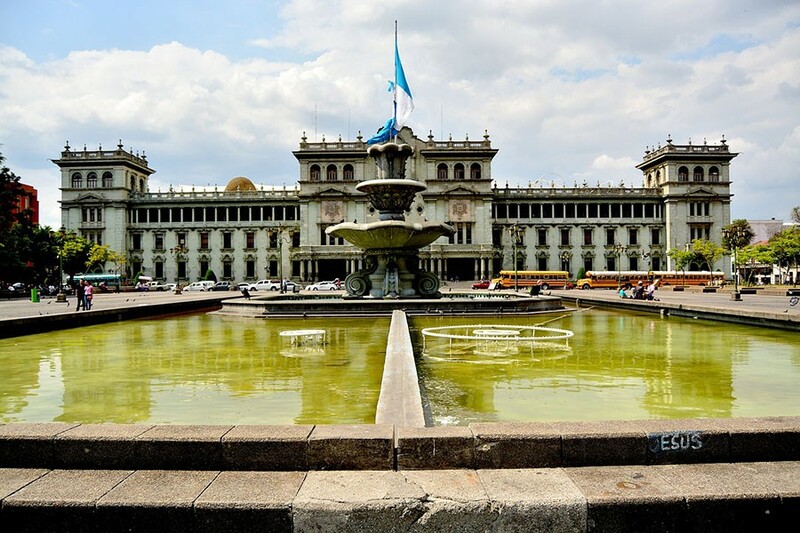 Check out my list of things Guatemala is known for to learn more about the country! Oh, and if you’re worried about the safety of Guatemala… don’t be. Here’s why. If you enjoyed this post, please share it or follow me on Facebook!